With bathing suit season rapidly approaching, I have been very good about picking healthy recipes from each of the countries I've cooked in recently. But, well, it's been quite a work week, so representing the beautiful country of Nigeria tonight are traditional coconut cookies to soothe the soul and satisfy my sweet tooth. Chewy, rich and macaroon-like, these coconut cookies are delicious eaten alone or with a glass of Black Mountain Chardonnay (thank you, Marylou), which is available for under $10 at Trader Joe's. Cheap is Good...Which my husband once said when I asked him if my recently "highlighted" blonde hair made me look cheap. But I digress. Located in west Africa, Nigeria is a Federal Constitutional Republic comprised of 36 states and its Federal Capital Territory, Abuja. Nigeria shares its land borders with the Republic of Benin, Chad, Cameroon and Niger. Its coast lies on the the Gulf of Guinea on the Atlantic Ocean. Nigeria is the most populated country in the world, as well as the most populated country in the world where the majority is Black. Roughly half of the population is Muslim, the other half being Christian with a small percentage practicing traditional religion. 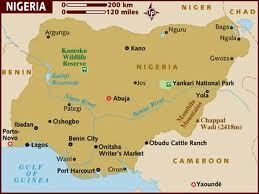 Nigeria is a geologically and anthropologically important country, as human habitation dates back to 900 BCE. Cuisine in Nigeria is primarily traditional, but has important influences from Portugal, India, Persia, Great Britain and North Africa. Food is generally spicy and deeply seasoned using chili peppers, herbs, palm, coconut and peanut oil. Jolof rice, tomatoes, onions, cassava spinach, peppers and coconuts are all staples in the Nigerian kitchen. Goat, chicken, fish, stews and skewered meats are just some of the foods enjoyed in the country. In a medium bowl, mix together the coconut, sugar and egg yolks to form a stiff dough. Squeeze into 1-inch balls. Combine flour and baking in powder in a bowl and mix lightly to combine, then roll coconut balls in flour mixture to coat. Place on a baking sheet, spacing about 2-inches apart. Bake for 20 minutes until golden. Final Assessment: These were delicious and very much like macaroons, which I love. I used large flake coconut, and I don't know if fine flake would have made the cookies have a creamier texture. Regardless, they were very good, easy to make and required ingredients most of us have on hand. I love these cookies it is one of the most famous in Nigeria and in some west African countries. By the way the pictures are wonderful. Thanks Anna! So glad you enjoyed it!! Hi Sadie, I just stumbled across you blog and I must say..fantastic job!I'm a food lover so I hope to try each and every recipe...yipee!